Place the first 3 ingredients in a medium bowl. Stir to combine. Set aside. In a large bowl, stir together the butter, egg, cheese and hot sauce (if using). Add the dry ingredients. Stir with a wooden spoon as much as you can, then use your hands to completely incorporate the dough. Shape dough into 1-inch balls and place on large, parchment lined cookie sheets. Bake for 5-7 minutes. (Leave oven on.) Remove cookies from the oven and press centers in slightly with the handle of a wooden spoon or your thumb. 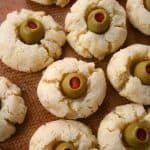 Place an olive into the center of each cookie. Continue baking for another 5-7 minutes or until set. Let cool and serve. Store covered in refrigerator for up to 5 days.